As I mentioned in a previous post, the meal is at the center of the family in Argentina. Or, as my new friends explained “the kitchen is the soul of the home”. 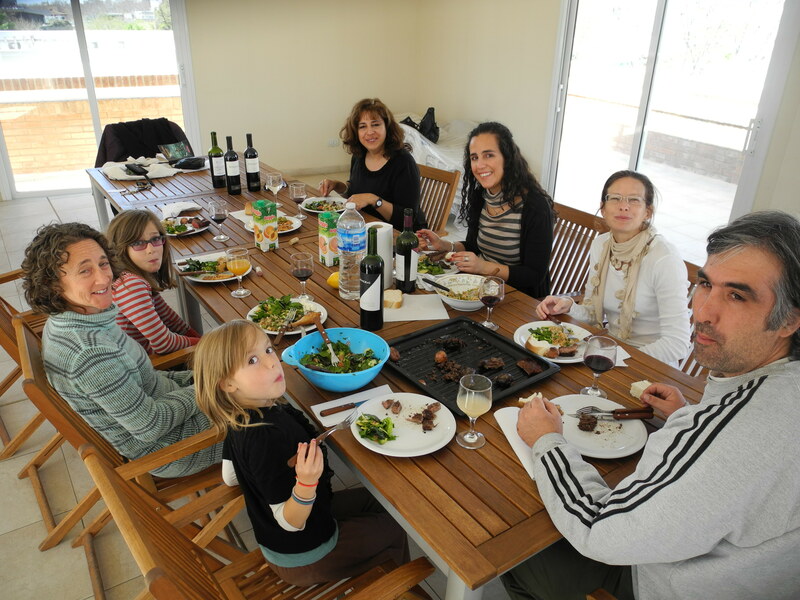 While the food may be different from what we eat in the US (or not) gathering together with family and friends around the table to eat hand made food and drink together is highly valued here, and it is a wonderful custom. 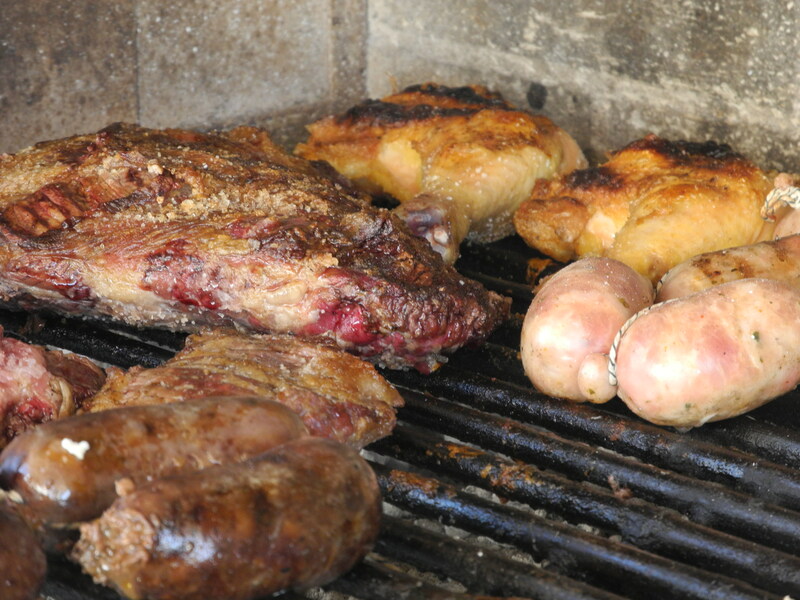 It was only a matter of time before we would get invited to our first Asado-the very traditional, very Argentinian grill meal. They are usually on weekends or holidays, because they are long events with much eating, drinking and laughter. The meal is centered entirely around assorted grilled meats, but I was invited to contribute salads which helped to balance things off a bit. It didn’t hurt that the group consisted of a new Expat friend and her Argentinian rural ag development boyfriend, a Mendocinan woman who is studying to be a chef, and another who is studying to be a sommelier, all of whom are hip to natural, whole foods.. Not a bad mixture of folks with whome to share our first Asado! 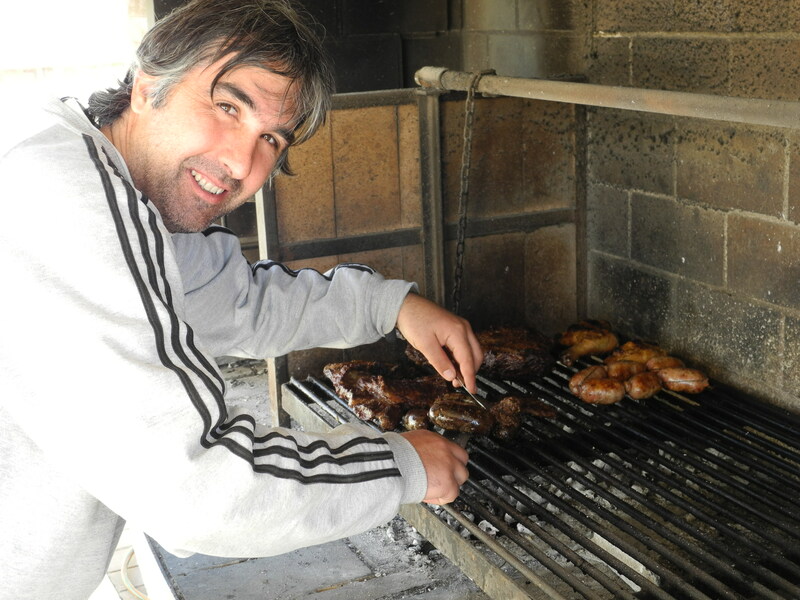 Ramiro, our grill master explained that the only seasoning he put on the meat is coarse salt. This is very similar to the chicken that Marta prepared for us, and the simplicity of this method is quite delicious. The meat turns out tender and flavorful, and the salt brings out the flavor to the subtle fat of the meat. 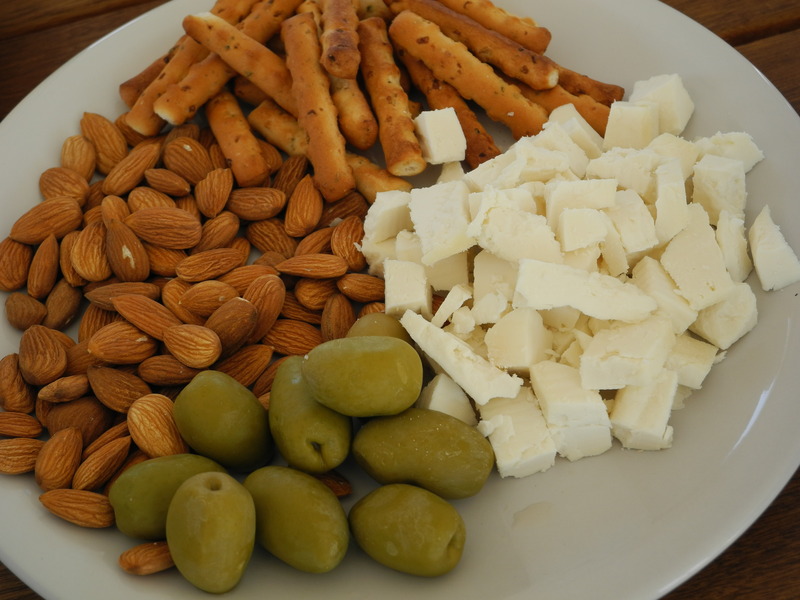 We started off with small snacks, including a local goat cheese from one of the farm’s Ramiro works with, and local olives which are also abundant here and the source of some fabulous local oil. 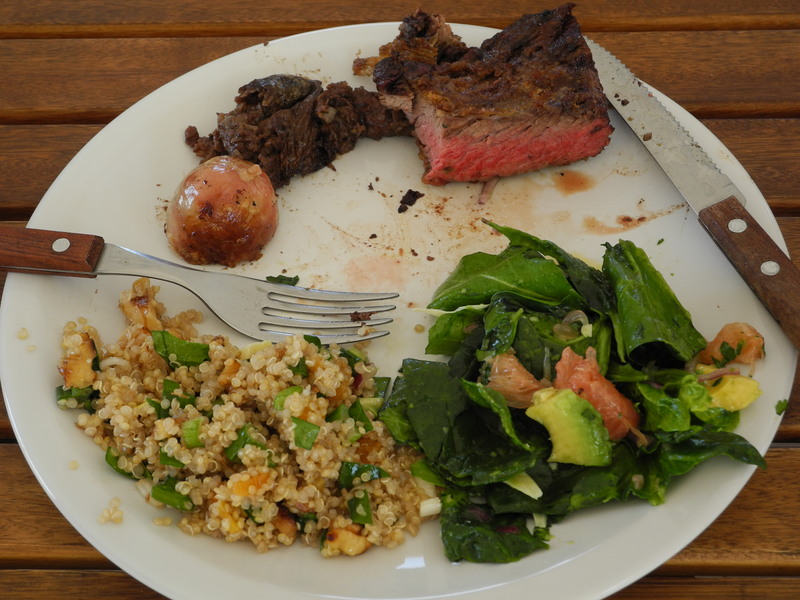 The two salads I contributed complemented the meat nicely, and added color, texture and flavor to the meal. 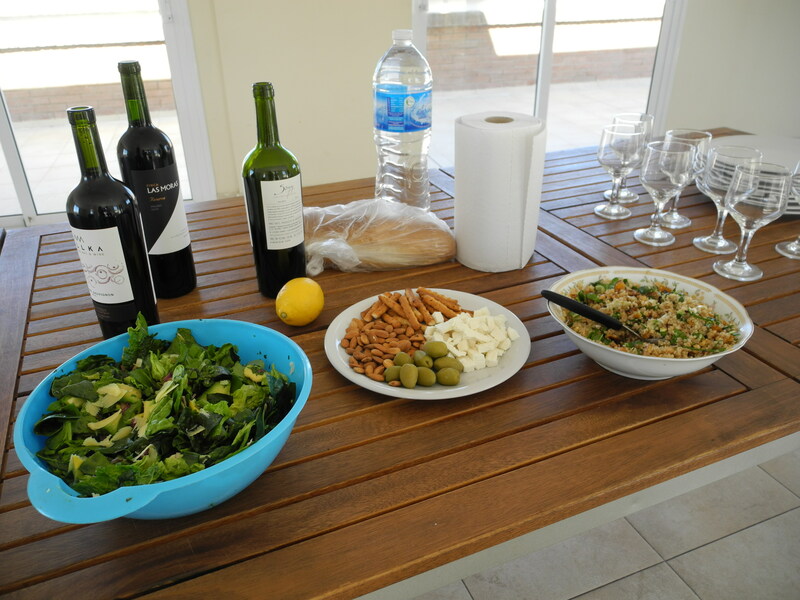 The first was primarily a green salad, with a mixture of spinach, arugula and lettuce, and including avocado, red onion, grapefruit and shavings of cheese (Sardo-a version of Romano). 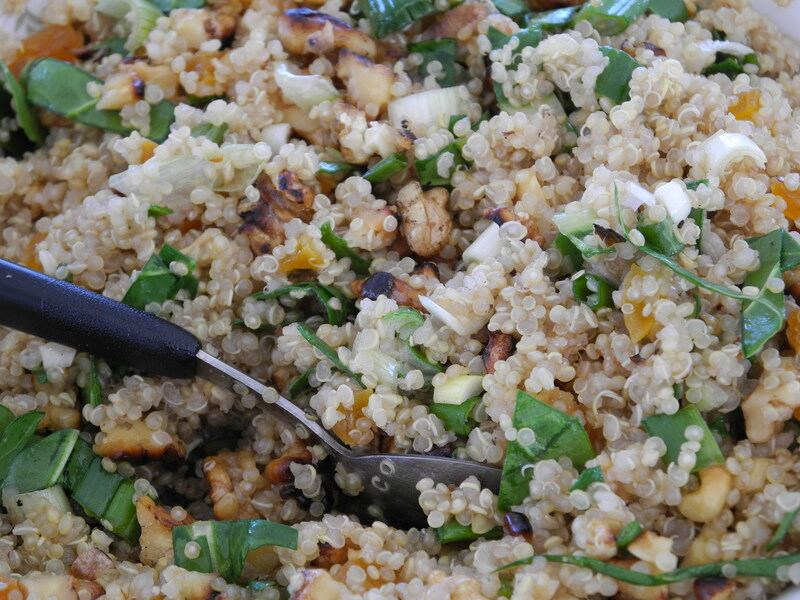 The other was a quinoa salad adapted from a recipe in my book, which included dried apricots, toasted walnuts, green onions and chard in a toasted sesame dressing. And of course there was wine. Plenty of it. The meal was lovely, the company was spectacular and the wine went down well. We laughed a lot, and enjoyed being together on a gorgeous Sunday in Mendoza. We even had a chance to soak our feet in the pool on the sunny patio with a beautiful view of the mountains. I created this recipe because I really wanted a cool summery grain salad, but something other than tabbouleh (nothing against that wonderful dish, but there’s more to life than mint). It is a joy to cook with sesame oil–its nutty flavor stands up to cooking and adds a wonderful layer of complexity to any dish. The fresh notes of honey and juice balance the tartness of the mustard, and the crisp cucumber and tangy currants are an unusual match finished by the sweet crunch of the nuts. The Family Kitchen: In addition to chopping cucumbers and chard leaves, this recipe has a lot of room for variation, so encourage the kids to taste and describe the flavors, and come up with other ingredients to add or to use as substitutes for those listed. 1 bunch chard leaves (or other greens like spinach, lacinato kale or mustard), stems removed and chopped small. The raw greens work fine in this salad as the small pieces soften in the dressing, but maintain their integrity as well as their bright color. In a small bowl, combine dressing ingredients and mix well. 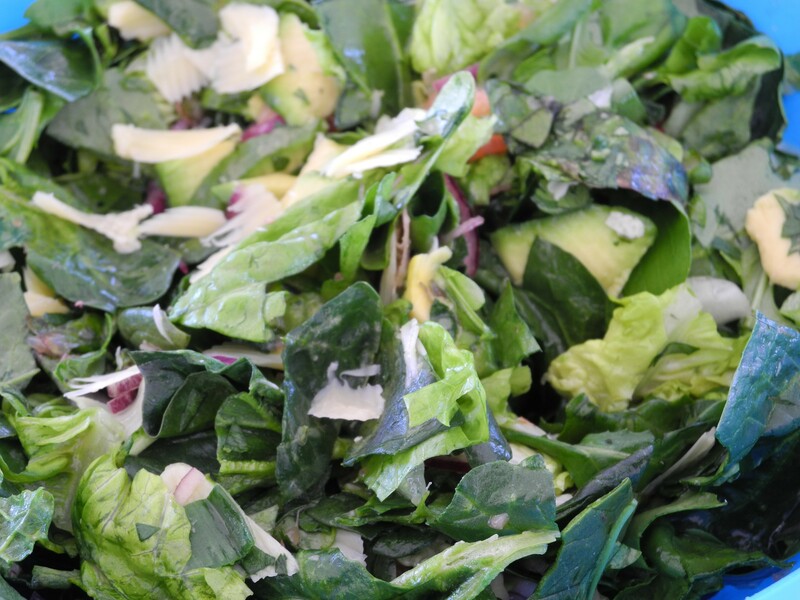 In a larger bowl, combine salad ingredients and pour dressing over salad. Mix well and refrigerate until very cold. Serve as is or over a bed of greens. I’ve been enjoying all manner of vegetable and quinoa dishes and will have to add this recipe to the ‘Make’ pile. I’m a huge fan of anything with sesame oil.